“Giveaways” at Internet conferences are usually just throwaways: A familiar assortment of pens, mints and USB keys plastered with company logos. But this week’s LeWeb conference in Paris, with the theme “Internet of Things,” would have done well to have a holiday gift store full of its presenters’ products. Since a lot of you probably couldn’t make it to Paris for this event, we’ve highlighted some of the items that were showcased. It’s an expensive group of stocking stuffers, to be sure, many of which are shipping now or will be soon. By now we’ve all seen how kids have a natural aptitude for smartphones. 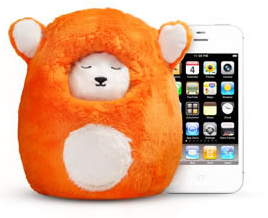 But Carly Gloge, the CEO of Ubooly, wants to bridge the app world with the physical world, and has spent the past year designing and building a stuffed animal that comes to life when an iPhone is stuck inside it. Using voice recognition that has been specially trained for kids ages 4 to 9, the Ubooly proposes games for youngsters and gives feedback on their participation based on the phone’s accelerometer. The toy costs $29.95, and is updated with free new content every two weeks. An iPad version is coming next year. The smartphone-controlled keyless door lock maker was a favorite story of many at the conference, having recorded $2.2 million in preorders on its own, after being rejected by Kickstarter this fall for being a home-improvement product. You can reserve one with a shipping date of late May 2013, for $179. 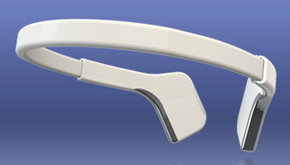 The InteraXon Muse is a brainwave-monitoring headband that sends live-state information via Bluetooth. It will include apps for healthy brain training and is also an open platform for developers, so someday you’ll be able to automatically dim the lights when you’re feeling relaxed, should you so choose. It’s on sale for $149 on Indiegogo today (regular price, $165), with expected delivery in June. You can see InteraXon CEO Ariel Garten’s presentation, including her own live brain monitoring, here. I wrote about this smart home/office concept yesterday; the company has a grand vision of wirelessly hooking up everyday objects so developers can write software that recognizes their presence and status, and helps them execute commands. Its home security, home monitoring and family tracking packs are currently available for preorder for Spring 2013.; they cost $299. This is yet another crowdfunded gizmo, having raised $1.2 million on Kickstarter in September. Crowdfunding has become especially popular with smart-gadget makers because it serves the dual purpose of providing funding and demonstrating demand. Can’t (or don’t want to) make it into the office? Double Robotics makes a wheeled iPad stand, so people who are teleconferencing can have more of a physical, mobile presence in a room. It’s currently sold out, but can be ordered for $1,999 for shipping next year. The wireless bathroom-scale maker has a new version out that includes Bluetooth as well as Wi-Fi. It costs $129.95 — around the same price as Fitbit’s Aria scale. Speaking of Fitbit, the maker of clip-on activity tracking devices, the company’s products now support Bluetooth technology. There’s the tiny new Zip, as well as the One, which includes a sleep tracker and an alarm clock. The Zip costs $59.95, and the One costs $99.95.